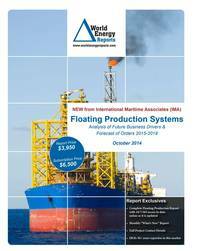 The February WER report identifies and updates details for 244 floater projects in the planning stage, 71 production or storage floaters now on order, 260 oil/gas floating production units and 15 floating regas units currently in service and 23 production floaters off field and available for redeployment contracts. Information is current as of 15 February. Also in the report are details for a gas/condensate FPSO ordered during the preceding month, description of two near term FSRU planned projects, delay of an FLNG project resulting from lower LNG prices and the decommissioning of an FPSO.